I'll admit it--I'm a bit of a crossword freak. I'm not particularly good at them, mind you; they get solved, but I use pencil and I take my time. I used to think I was pretty good until I read about people that would solve the Impossible New York Times Friday Puzzle in some ridiculous time like forty-five seconds, which is a level of dedication I'm more than willing to cede to East Coast liberals and grandparents who find the Tommy and Tuppence stories more amusing than dreadfully banal. Oh, look, dear, I found a clue. Turns out we're dreadfully boring. And I always thought that I would be the type of person to find cryptic crosswords fun to do--the combination of wordplay and crosswords being unbearably satisfying. I really did think it would be just awesome. And when I was a child, I actually bought a Guide to Cryptic Crosswords, the sort of thing that cost $24.99 plus shipping and handling--the functional equivalent back then of two years of allowances and birthday money--and now would be available free on the internet. Except, though, it turns out that I don't like cryptic crosswords. At all. They're just too weird, even for a word freak like me, and I think I've maybe completed an entire one such puzzle in my life. 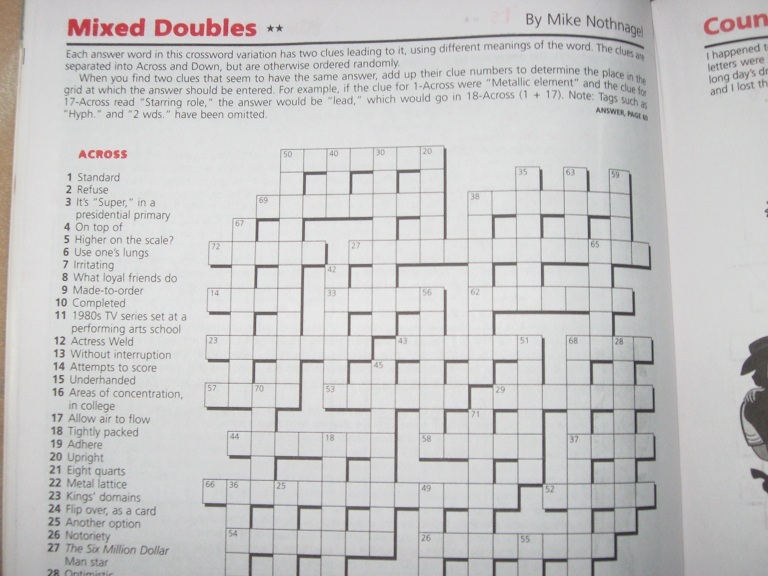 So, anyway, in the United States, one of the few places to get quality cryptic crosswords is Games Magazine , a great magazine that has had an unfortunate publishing history--it was out of commission for years, and even today has variable article quality and a piss-poor web site. But the puzzles are nothing if not top-rate, and so I buy the issue nearly every month. Now, I'm not one for gimmicks in my puzzles, and Games Magazine has gimmicks in spades. There are crosswords shaped like animals and ones that wrap around itself and ones shaped like stars with clues that go in four directions and on and on. They're kind of strange and not altogether all that different than just a normal crossword, so I don't get too worked up about it. 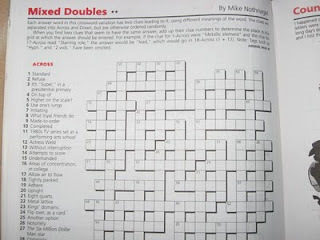 However, there is one specific type of puzzle I go certifiably batshit crazy over, and it's called Mixed Doubles. Basically, it's a non-symmetrical skeleton crossword (i.e., doesn't have the familiar black squares to block off answers and make everything symmetrical). However, the clues aren't numbered in the normal fashion. Basically, all of the answers have two clues--the answer is valid for both, usually a heteronym (as in desert (sandy terrain) and desert (leave)). You have to find the two matching clues, add up their numbers, and that is where the clue goes. I absolutely love these, but they don't show up very often and they are usually quite short--I mean, there are only so many of those answers you can come up with. OH MY GOODNESS this is nearly twice the size of the normal puzzle. I can't bring myself to do it, because once it's done I can't do it any more, and I'm not sure I can take that sort of disappointment. I will eventually break down, of course, but I don't want to. It is very sad that I am this excited about a gimmick crossword puzzle that for the most part only English professors and dead people would find interesting. I'm neither an English professor nor dead, but I'm as enamored with the Mixed Doubles as you are. (I found your post after searching online for more of them.) Are you also addicted to Split Decisions? Games issues with both are about as puzzlicious as a magazine can get.